The TIBETAN AND HIMALAYAN CULTURAL CENTER at Tsechen Kunchab Ling Temple is dedicated to His Holiness Dalai Lama’s and His Holiness Sakya Trichen’s vision of preserving the unique religion and culture of Tibet and neighboring Himalayan regions. The Center provides the only place of its kind for Tibetan and Himalayan people to celebrate cultural and religious events and foster their rich cultural heritage in the new generation of children born in the U.S. It also provides a venue for explaining Tibetan and Himalayan culture to non-Tibetans. Located just an hour from the vibrant population of over 20,000 Tibetan and Himalayan people living in the New York/New Jersey area, the temple and cultural center are a preferred destination site for Tibetan and Himalayan celebrations. The beautiful traditional temple, surrounded by spacious grounds hung with prayer flags provides a place where people of all nationalities can immerse themselves in an atmosphere that transports them to Tibet. The TIBETAN AND HIMALAYAN CULTURAL CENTER at Tsechen Kunchab Ling Temple is a unique place. There is no other place on the U.S. east coast where the celebration, practice, and demonstration of the rich Tibetan and Himalayan religion and culture are integrated into one location. The Center welcomes Tibetan and Himalayan people, and people of all nationalities for programs, celebrations, and classes, or just to enjoy the quiet beauty of the grounds and imagine themselves in Tibet. Two large cultural event rooms on the ground level of the temple hold displays about Tibetan and Himalayan peoples and their culture, showcasing the traditional landscapes, costumes, language, and traditional way of life. The rooms provide a perfect venue for special programs, classes, instruction, and demonstrations. The Tibetan and Himalayan Cultural Center at Tsechen Kunchab Ling is dedicated to the preservation of the special cultural and religious heritage of Tibet and neighboring Himalayan regions, transmission for that heritage to future generations, and explanation of the region and its culture to the wider world. This is an important priority of His Holiness the Dalai Lama, His Holiness the Sakya Trizin, and many other Tibetan and Himalayan religious and political leaders. There are over 20,000 people from Tibet and the Himalayans recently immigrated to the New York and New Jersey area, and many different associated regional associations. The Tibetan and Himalayan Cultural Center at Tsechen Kunchab Ling is the only venue of its kind in the country which offers these people and associations a focal location for the practice and preservation of their endangered culture, while simultaneously explaining Tibetan and Himalayan culture to the world. Many exhibitions are created in partnership with the Jacques Marchais Museum of Tibetan Art, Staten Island, NY, who generously loan museum artifacts from their collection for display. Horses have been an important part of nomadic life on the Tibetan plateau for centuries. Even today, great horse festivals take place every year in many parts of Tibet. Tibetan equines are generally small but strong and are known for their endurance, sure-footedness, and dexterity. Horses have been an important part of life among the nomads of the Tibetan plateau, where they are still used for riding, herding, and pack transport. For centuries, the prized horses of the region were traded with China for tea along the so-called Tea-Horse Road. Several types of equines are unique to Tibet. The common Tibetan pony has a pronounced jawline, a straight profile, and small ears and eyes. The neck is a muscular and a bit short, the chest is deep, the shoulder is straight. Tibetan ponies have powerful hindquarters, and short, strong legs, making them ideal workhorses. The Nangchen horse is native to the Kham region of Tibet and has been bred there purely since the 9th century. They are powerful and fast, said to have many of the characteristics of a modern racehorse. They have refined features and are swift and agile. Their unique characteristics include adaptations to the very high altitude of the region, including enlarged lungs. The Riwoche horse came to international attention in 1995. Previously unknown outside of Tibet, they were found in an isolated valley in Kham by French ethnologist Michel Peissel. The horse’s primitive appearance and small size led to speculation that it might be an evolutionary link between the prehistoric wild horse and the modern domestic horse. Summer is the season for great equestrian festivals on the grasslands of the Tibetan plateau. Celebrating feats of traditional horsemanship, horse racing, and archery, these festivals date back many centuries. In recent years, they have taken on increased importance, becoming occasions for celebrating traditional culture generally and for engaging in barter and other forms of economic exchange. The festivals are held in June or July when the pastures are green and the animals stout and strong. With their horses colorfully decorated in traditional costume and ornaments, deft riders compete with one another in races and in special contests of skill. Racing tests both the agility of the rider and the grace, dexterity, strength, and stability of the horse. Other competitions include feats like shooting arrows while on horseback and picking up khata (white scarves) from the ground while galloping at ferocious speeds. The festivals typically last for several days and take place in nomadic regions. The largest festivals attract thousands of participants, many of whom travel great distances to attend. Pieces in the exhibition are below. Mouse over each picture to see the title of each piece. Click on each picture for an explanation. 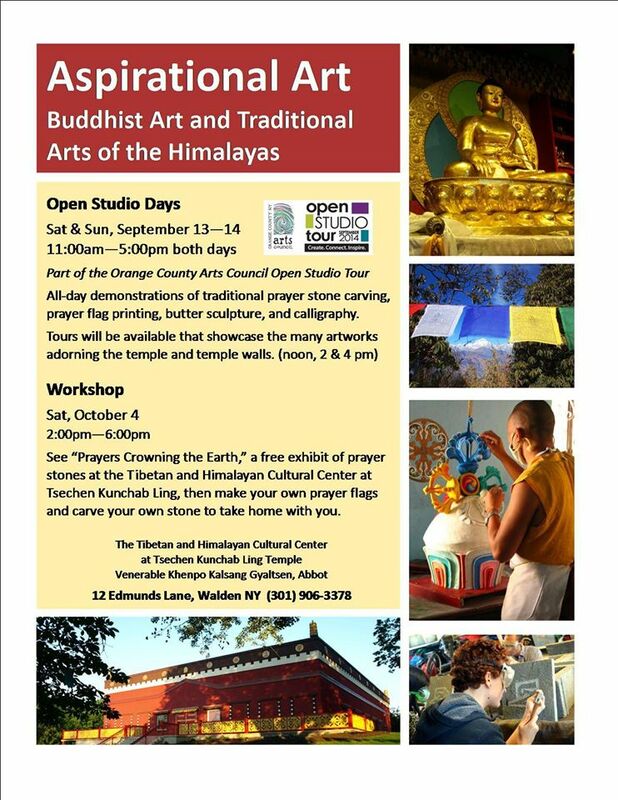 On September 13 and 14, 2014, The Tibetan and Himalayan Cultural Center at Tsechen Kunchab Ling participated in the Orange County Arts Council Open Studio Tour by offering the program Aspirational Art: Buddhist Art and Traditional Arts of the Himalayas. Dozens of guests began their visit to the temple with a guided tour of the fine statues and thangkas in the shrine room. Then they proceeded to the Cultural Hall for an opportunity to see the temple’s religious artists at work creating traditional Buddhist religious art. Venerable Sangye Rinchen sculpted finely-crafted torma butter sculpture, Reverend Jhampa Nyima wrote inspiring verses in beautiful calligraphy, and Mr. Lugru Thupa worked with hammer and chisel make prayer stones. Guests sampled Tibetan sweet tea and other traditional snacks and thoroughly enjoyed their glimpse of the combination of religious aspiration and traditional art. On the beautiful spring morning of April 19 and 20, 2014, His Holiness the Forty- first Sakya Trizin consecrated the newly opened Tibetan and Himalayan Cultural Center at Tsechen Kunchab Ling. The ceremony was attended by Her Eminence Gyalyum Chenmo-la, Venerable Rinpoches, Khenpos, monks, and nuns, officials from the Tibetan government-in-exile, officials from the Village of Walden, the presidents and board members of various Tibetan and Himalayan Associations, and many members of the general public. “His Holiness the Dalai Lama, His Holiness the Sakya Trizin, His Holiness the Karmapa, and all other great Tibetan lamas are strongly encouraging the preservation and promotion of Tibetan religion, language, and culture. In support of this, since 2001, we have worked to build a temple building and establish religious activities here as the seat of His Holiness Sakya Trizin in the U.S. In addition to preservation and transmission of religion, His Holiness also encourages the preservation of Tibetan language and culture. Because of this, for the past ten years, the temple has frequently hosted cultural celebrations by many different Tibetan and Himalayan groups. Today, His Holiness is adding two new facilities to the existing shrine room: First, a library to promote the study of Dharma and help to preserve the Tibetan language, and second, a Tibetan and Himalayan Cultural Center for the celebration of Tibetan culture. In this way, in the shrine room and religious activities, His Holiness is promoting the preservation and practice of Tibetan religion; in the new library, the study of Dharma and preservation of Tibetan language; and in the first-floor cultural center, the celebration and appreciation of Tibetan and Himalayan culture and its transmission to the next generation of children. This dream of preserving and transmitting Tibetan religion, language, and culture is shared by many Tibetan and Himalayan associations, of which there are over 30 in the NY NJ area. Eight of those associations have become members of the Tibetan and Himalayan Cultural Center at Tsechen Kunchab Ling, and we are sure that there are more associations yet to come. The eight founding member associations are Sakya Tsechen Association, Tibetan Ngari Association of New York and New Jersey, Manang Samaj, Mustang Kyidug USA, Walung Community of North America, United Sherpa Association, Dege Kyidug of North America, and Ligdro Dechen Rolmo. We thank them all for joining us to make efforts together to preserve Tibetan and Himalayan culture and help to transmit it to the next generation. However, interest in Tibetan and Himalayan Culture is much wider than just the Tibetan and Himalayan community and a few Western Buddhists. We are happy that the new library is developing joint programs and lectures with the local Josephine-Louise public library here in Walden. The new Cultural Center is also developing plans for joint exhibitions with the Jacques Marchais Museum of Tibetan Art on Staten Island. Through partnerships like this, we hope that the new library and cultural center will help to explain Tibetan and Himalayan culture to the wider world. His Holiness the Forty-first Sakya Trizin presided over the opening ceremony celebration, which included an offering of a daylong program of colorful dance and tuneful song from the eight founding-member cultural organizations listed above.